A semi-dwarf variety that produces huge, juicy fruit in mid to late July. One cherry is a mouthful! 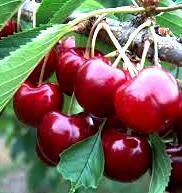 Firm cherries resist splitting. Self-fertile. Use as a pollinator for other varieties. GROWN SAFE™, For your safety and peace of mind, we give you our word that for at least the past twelve months the only pest controls used on our fruit and berries are those listed by the Organic Materials Review Institute (OMR) for organic fruit and berry production. Fertilize in spring with an all purpose fertilizer before new growth begins. As our world is changing so are we. Gardens have always been in two categories, one for food the other for beauty. More and more these categories are becoming one. Landscaping with edible is becoming increasingly popular. Not only is there beauty but there is an added benefit of healthy homegrown items. Apartment living can also benefit from smaller plants from vegetables and blueberries to strawberry and everything in between can be grown in pots on patios or balconies. 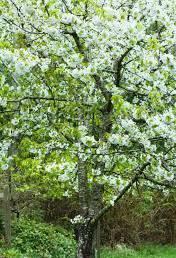 The fruit trees we offer are semi-dwarf.